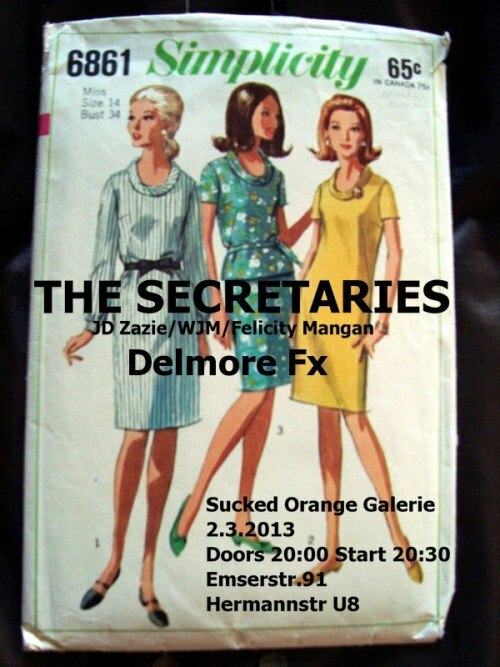 On Saturday night, March 2nd, Sucked Orange Gallery based in Berlin will guest THE SECRETARIES and DELMORE FX. New trio formed in Berlin in 2012. The Secretaries bring together three strong personalities to explore new musical directions and forms. Works are composed and performed through the reproduction of recorded material whose manipulation acquires a new meaning in a game of tensions and balances, interweaving and setting of concrete sounds, environmental field recordings, rhythms, impulses, noises, and mistakes. DELMORE FX plays improvised compositions based on homemade recordings, file it under bedroom tribalism. This is the solo project of Elia Buletti, founder and co-director of Das Andere Selbst, a music and events label based in Berlin.